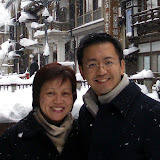 Our old friends, Terence and Vivian were back visiting Singapore after getting married and living, working, and setting up family in Hong Kong. It's been ages since we met up. We got married around the same time, and had boys around the same time too! Nathaniel is 6 months old now... 5 months younger than Ethan. Though both boys weren't at their cutest they did enjoy their day out in Vivo City and loved staring at the balloons we got for them. We lounged around in a coffee joint afterwards. Do you think the babies look alike? Cos people say Terence and Ivan look alike... someone even congratulated Terence thinking he was Ivan at our wedding 3 years ago. Ethan loved lounging with his Dad after lunch. He thinks Dad looks very cool with sunglasses, but actually it's eye protection for 2 weeks after LASIK so that Ethan doesn't accidentally reach up and maul Daddy's eyes.